Τo evaluate the clinical relevance of CEACAM5mRNA-positive circulating tumor cells (CTCs) in patients with metastatic colorectal cancer (mCRC). Peripheral blood was obtained from 436 patients with mCRC before the initiation of systemic therapy. A second sample was obtained on treatment assessment from 296 (67.9%) patients. The detection of CEACAM5mRNA-positive CTCs was performed using a real-time PCR assay. The patients’ median age was 67 years and PS (EGOG 0–1) 92%; KRAS exon 2 and BRAFV600E mutated primary tumors were identified in 31.9% and 6.4% of the tested patients, respectively, whereas metastasectomy was performed in 17.7% of the patients. Circulating CEACAM5mRNA-positive CTCs were detected in 125 (28.7%) and 85 (28.7%) patients at baseline and on treatment assessment, respectively. The detection of CEACAM5mRNA-positive cells was revealed, in multivariate analysis, as an independent prognostic factor associated with decreased PFS (HR 1.6; 95% CI 1.1–2.5; p = 0.026) and OS (HR 2.2; 95% CI 1.3–3.2; p < 0.001). The detection of CEACAM5mRNA-positive CTCs in patients with KRAS and BRAFV600E mutations was correlated with shorter PFS (p = 0.041 and p = 0.022, respectively). Moreover, OS was significantly shorter in patients with CEACAM5+/KRAS mutations compared to those with CEACAM5+/KRAS wt tumors (p = 0.023). 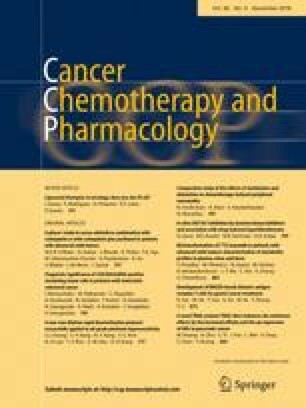 Detection of peripheral blood CEACAM5mRNA-positive CTCs is an adverse prognostic factor correlated with poor clinical outcome in patients with mCRC, especially in patients with KRAS and BRAF mutated tumors. The online version of this article ( https://doi.org/10.1007/s00280-018-3666-9) contains supplementary material, which is available to authorized users. This work was partly supported by the Cretan Association for Biomedical Research (CABR), the Hellenic Society of Medical Oncology (HeSMO) and the SYNERGASIA 2009 PROGRAMME (co-funded by the European Regional Development Fund and the General Secretariat of Research and Technology in Greece), Project code: Onco-Seed diagnostics.